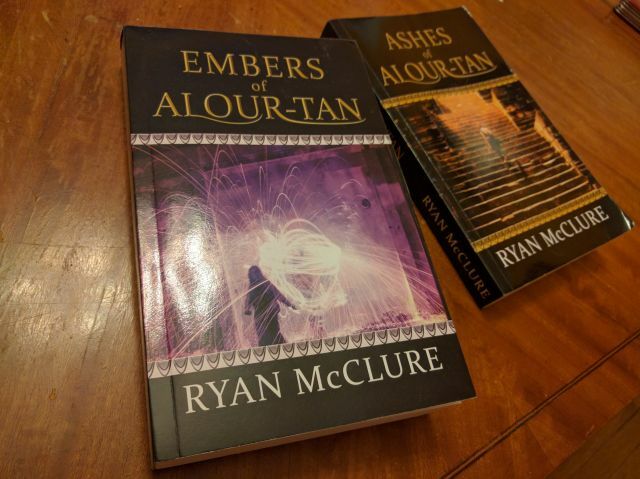 Physical copies of Embers of Alour-Tan are now available! Embers is now available in hard copy from Amazon and CreateSpace! What a weekend. What a week. What a three and a half years. Both it and Ashes are now just $4.99 in their digital forms. Check out chapter one and chapter two for free, right here on the blog! Welcome to Embers of Alour-Tan release day! The second Release Day Tidbit is the full and complete text of Chapter Two! Welcome to Embers of Alour-Tan release day! The first Release Day Tidbit is the full and complete text of Chapter One! Hey, it’s the end of March. Where’s Alour-Tan II? The short answer: almost done, but not quite. As mentioned earlier, I was on-track to be done by the end of the month. Everything had started to align. Cody and I started churning through the polish pass; cleaning up wording, tossing unnecessary sentences, refining entire paragraphs to improve clarity and impact. After (once again) stressing over what I would do for the book’s cover, having a preconceived notion of what I wanted that cover to be, I stumbled across a stock photo1 that — though it didn’t fit the preconception — declared itself the perfect cover for this story, so I even had that part all set. I don’t know what happened yesterday, but I got up, went down to make coffee, started working on the book…and didn’t stop until I reached the end of the book. The third draft is done! What does that mean? The third draft is the final story- and character-revision pass. The next pass, generating the final draft, comes from an aloud read-through with Cody for phrasing, grammar gaffes, and general technical consistency. This will fill a few evenings and will also be Cody’s first actual exposure to the full text of the story, as opposed to just hearing me talk about it. Meanwhile, I’ll also be doing peripheral work: figuring out the cover, deciding what appendices to add, etc. Most importantly, though, it means that the book is coming. Soon. Very soon. As with Ashes, I’ll be releasing a few sample chapters here on the blog once they’re finalized. That could even be imminent, so stay tuned! The third draft is now one third complete. Once I finish my revisions for this draft, all that’s left is the final read-through and wording/grammar cleanup. Still aiming for and on track to hit a by-end-of-March release date. Once again, I must thank you for your patience during the long update droughts this blog so often experiences. It’s not for lack of interest on my part, nor for lack of things to say, but rather due to feeling perpetually “behind” with everything and “Oh, hey, I should write a post about that” ideas succumbing to the maelstrom that manifests from being pulled in a million directions at once. That said, I at least come bearing good news! The second draft of Ashes of Alour-Tan’s sequel is DONE, clocking in at just under 103,000 words. In point of fact, it’s been done for almost four weeks. The discerning and critical eyes of my Beta readers now prowl through it, assessing just how much work I’m in for when it comes time to hammer the second draft into the third (and final) draft. I’ve asked them to submit their feedback by the end of the month. My current goal is to publish the book by the end of Q1 2016 (i.e. sometime in March), a goal I very much aim to hit. Alour-Tan II1 has been with me for far too long; it needs to be out there with all of you. In similar news, while Alour-Tan II is under review, I’ve started heavily preparing for Alour-Tan III‘s first draft. I’ve no desire to repeat the mistakes I seem to continue making by failing to properly and thoroughly outline before diving in. Every single time, thus far, starting the first any draft too early has ensnared me in some kind of mid-book plot conundrum that takes demoralizing quantities of writing time and work to resolve. I want to see those coming and fix them before they amass an umpty-thousand word juggernaut behind them. It’s also my hope and goal that this will streamline the writing process itself and, to that end, I’m presently aiming to outline, write, revise, and publish Alour-Tan III by the end of this year as well. We’ll see whether or not that actually happens. As with the first draft, I thought it might be of interest to do something of a retrospective on the process of writing this one. A fairly inconsistent close-out to the end of the year, followed by three consecutive 2000+ word days finally spell the completion of the first draft of Alour-Tan 2! I immediately set to outlining Alour-Tan 3 and sent off the draft to my First Reader, who has been providing me regular and fantastic feedback while progressing through the book. Once all the feedback is in, I’ll fire up a new round of Writing in Public to chronicle the second draft. Thu, Dec. 25 0 75756 82612 End of year vacation. Didn’t quite hit the 80k I wanted to hit in the November+December timespan, but I needed to not think about any sort of work for the remainder of the year. Previous Writing in Public post here. Per my tweet from a few days back, Act Two is done and now it’s time to run down the home stretch to the end of this draft of this book! Then begins the revision process to make it not abjectly terrible. Sat, Nov. 29 994 50634 57490 Regular NaNo goal achieved. Also, a travel day, so not much time for writing. Sun, Nov. 30 0 50634 57490 More traveling. Recovering. Mon, Dec. 1 2513 53147 60003 Sixty thousand! Tue, Dec. 2 0 53147 60003 Not sure what happened here. Sat, Dec. 6 0 59221 66077 In general, I like to take one (deliberate) day off a week and that day is generally Saturday. Mon, Dec. 8 0 61243 68099 Funky commuting plus staying out late. Tue, Dec. 9 0 61243 68099 Movie night. Wed, Dec. 10 0 61243 68099 Working late. Thu, Dec. 11 0 61243 68099 More working late. Fri, Dec. 12 2110 63353 70209 Seventy thousand! Sat, Dec. 13 0 63353 70209 Party!